This item is currently on backorder. Orders containing this item will ship as soon as we have the 500 ml Nextzett Cockpit Premium in stock. Estimated ship date: 4/30/19. Check out the 10 L that is in stock right now. The Nextzett Cockpit Premium is simply an amazing product that you try once and love forever. This product is meant to help you clean and protect the interior while leaving behind a flawless finish. Use it on the dashboard, doors, console, navigation screens, arm rests, leatherette seats, vinyl trim and so much more. The formula utilizes gentle cleaners that help you remove dust, dirt, oils, and much more from the interior. It also leaves behind a micro-barrier of protection from harmful UV rays. The surface looks richer but without any glossy appearance and the surface will not feel oily at all. It uses no silicone and it's a water based formula that is good for the interior. It has a very light citrus scent that makes using this product very pleasant. The Cockpit Premium is truly a one of a kind product that just can not be compared to any other product. While many other formulas can provide ample UV protection, none of them compare to the brilliant finish Nextzett can leave behind again with no oily residue. Mist it on the surface or directly on a microfiber towel and just wipe the desired surfaces, it's just that simple. 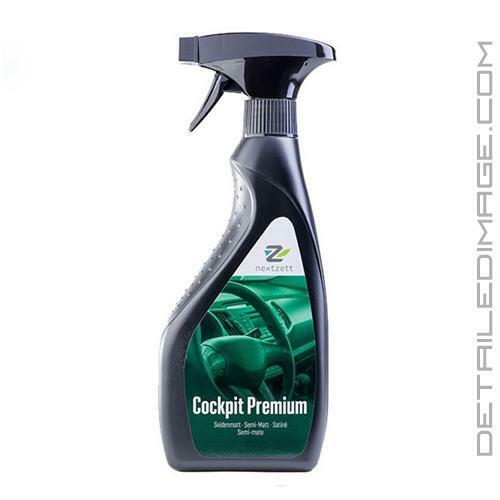 The Cockpit Premium is a must own product that detailers around the world use on a regular basis both professionally and personally. Cleans all interior clear and colored plastic surfaces. Leaves a shine-free, non-slip finish. Leaves a fresh citrus scent! Directions: Shake well before use. Apply evenly onto dry, clean surface that is out of direct sunlight and cool to the touch. Allow to penetrate surface then wipe off excess with a clean, lint-free cloth. For very dry surfaces, repeat the process to ensure even coverage. After use, turn spray seal to close. Apply as needed. Use only as directed. Please recycle empty container when possible. This is my 2nd Bottle, it works well & smells decent. I use this on my dash, door panel plastics, carbon fiber trim, and the plastics under the hood. It does a fantastic job of leaving going on and wiping off easily. Leaves a smooth and satin look to all materials applied to. Smell reminds me of a citrus peel. I typically use this to clean my dash and plastics before applying my Gtechniq C6 guard. Solid product. This stuff is awesome, does a great job cleaning and leave behind a nice subtle coating of protection. Will def be buying more when it runs out!